Copies of the above files are available for review in the Nelson County Department of Planning and Zoning, located at 80 Front Street, Lovingston, Virginia, Monday through Friday, 9:00 a.m. to 5:00 p.m. Alternately, you may call the Planning and Zoning Office at 434 263-7090 or toll free at 888-662-9400, selections 4 and 1. Nelson County does not discriminate on the basis of handicapped status in admission or access to its programs and activities. Accommodation will be made for handicapped persons upon prior request. Consideration of a Class C Tower Permit application requesting County approval to use the specified subject property for a “130’ Self Support Tower”. The subject property is located in Arrington off of Diggs Mountain Rd, Tax Map Parcel #77-A-2A (85 acres), owned by Saunders Farms LLC. The subject property is zoned Agricultural (A-1). Following these public hearings, the Planning Commission may vote to forward one or more applications to the Board of Supervisors (BOS) (with a recommendation for approval; a recommendation for approval with recommended conditions; or a recommendation for denial) for action by the Board. Prior to taking any vote to approve, modify, or reject any of these applications, the BOS will also conduct a public hearing for each. The date of the BOS is set for March 12th, 2019 if no additional notice is given. 80 Front Street, Lovingston, Virginia, Monday through Friday, 9:00 a.m. to 5:00 p.m. Telephone inquiries may also be directed to the Department of Planning & Zoning, (434) 263-7090, or toll free at 888-662-9400, selections 4 and 1. Nelson County does not discriminate on the basis of handicapped status in admission or access to its programs and activities. Accommodation will be made for handicapped persons upon advance request. Consideration of Special Use Permit application requesting County approval to use the specified subject property for a restaurant use. The subject property is located at Tax Map Parcels #6-A-131 (8.126 acres) and #6-A-163D (2.811 acres) at 9485 Rockfish Valley Hwy. The subject property is zoned A-1 and owned by Rockfish Valley Events LLC. Consideration of Rezoning from B-1 to R-2 with concurrent Special Use Permit for a Bed and Breakfast, Class A Use. The subject property is located at Tax Map Parcel #62-A-3 (7.48 acres) located on Rockfish River Rd. The subject property is owned by Rockfish River Realty, LLC. Following these public hearings, the Planning Commission may vote to forward the applications to the Board of Supervisors (BOS) (with a recommendation for approval; a recommendation for approval with recommended conditions; or a recommendation for denial) for action by the Board. Copies of the above files are available for review in the Dept. of Planning & Zoning office, 80 Front Street, Lovingston, Virginia, Monday through Friday, 9:00 a.m. to 5:00 p.m. Telephone inquiries may also be directed to the Dept. of Planning & Zoning, (434) 263-7090, or toll free at 888-662-9400, selections 4 and 1. Nelson County does not discriminate on the basis of handicapped status in admission or access to its programs and activities. Accommodation will be made for handicapped persons upon advance request. Consideration of Special Use Permit application requesting County approval to use the specified subject property for 6 individual cabins (motel). The subject property is located at Tax Map Parcels #6-A-131 (8.126 acres) and #6-A-163D (2.811 acres) at 9485 Rockfish Valley Hwy. The subject property is zoned A-1 and owned by Rockfish Valley Events LLC. Consideration of Conditional Use Permit amendment to modify conditions on existing airstrip. The subject property is located at Tax Map Parcels #21-A-114A1 (6.073 acres) and 21-13-9 (.611 acre portion) located on Edgewood Dr. The subject property is owned by Ronald and Nancy King. Consideration of a request from Atlantic Coast Pipeline LLC for a Variance to construct a pipeline across a floodplain in conformance with Article 10 of the Nelson County Zoning Code for construction of a natural gas pipeline across property owned by Ronald Slaughter Jr. & Others, 14815 Thomas Nelson Hwy, Lovingston, Virginia and further identified as Tax Map #45-A-25. 1434 Starvale Ln, Shipman, VA – owned by Gillis Rodgers, and further identified as Tax Map #46-A-34. Consideration of a request from Atlantic Coast Pipeline LLC for a Variance to construct a pipeline across a floodplain in conformance with Article 10 of the Nelson County Zoning Code for construction of a natural gas pipeline across property owned by James & Virginia Powell, 884 Wheelers Cove Rd, Shipman, Virginia and further identified as Tax Map #59-A-23. Consideration of a request from Atlantic Coast Pipeline LLC for a Variance to construct a pipeline across a floodplain in conformance with Article 10 of the Nelson County Zoning Code for construction of a natural gas pipeline across properties owned by Greenway S Corporation, Tax Maps #60-3-15, 60-3-16, and 60-A-28. Copies of the Applications are available for public review in the Planning and Zoning Office, 80 Front Street, Lovingston, Virginia, Monday through Friday, 9:00 a.m. to 5:00 p.m. or by calling the Planning and Zoning Office at 434 263-7090 or toll free at 888-662-9400, selections 4 and 1. Information may also be accessed online at http://www.nelsoncounty-va.gov/departments/planning-zoning/board-of-zoning-appeals/. The Public should be advised that the Board of Zoning Appeals procedures for conducting these Public Hearings are on file and can be viewed at the above address or online. It will be necessary for anyone wishing to speak at the Public Hearings to fill in a sign-in sheet prior to the commencement of the Hearings; sheets will be located outside the Hearing Room. The Public is encouraged to familiarize themselves with the Hearings Procedures and arrive leaving ample time to sign-in if anyone wishes to speak at the hearings. There will be a separate Hearing on each variance Request. If a Hearing is commenced and not completed the Hearing will be adjourned from day to day as announced at the Hearing. Application #2018-02 is for a Conditional Rezoning (from R-1 to B-1) to use an existing building as a retail store/restaurant and concurrent Special Use Permit application #2018-08 is requesting use of the subject property for a multi-family dwelling. The subject property is owned by Curtis Bruguiere, is located at 1889 Avon Rd, Afton and is Tax Map Parcel #7-A-4 (0.94 acres). Application #2018-09 is for a Special Use Permit requesting approval to build a single family home on property zoned B-1. The subject property is owned by Henry Fitzgerald, is located on Colleen Rd., Arrington and is Tax Map Parcel #66-A-64 (4.1 acres). Copies of the above files are available for review in the Dept. of Planning & Zoning office, 80 Front Street, or the County Administrator’s Office 84 Courthouse Square Lovingston, Virginia, Monday through Friday, 9:00 a.m. to 5:00 p.m. EOE. Pursuant to §15.2-5431.25 (B) of the Virginia Wireless Service Authority Act, the Nelson County Broadband Authority resolved to hold a public hearing which will be held at 1:00 PM on December 11, 2018 in the General District Courtroom of the Courthouse, Lovingston VA. The NCBA will have a limited number of fibers available for dark fiber leasing at an annual rate of $1,250 per leased fiber per mile. The minimum number of miles per fiber is five miles. Initial fiber leases will be leased on an annual basis for a period of not less than one year and not more than two years. If available, NCBA will allocate a maximum of 24 NCBA fiber strands in any given cable for dark fiber leases. No single provider may lease more than 8 dark fiber strands allocated in any cable. Dark fiber operating leases will be available only to broadband service providers who provide, or intend to provide, broadband services in Nelson County. Non-recurring charges (NRC) are those costs incurred in connection with the installation of the fiber drop and ONT. The customer will be responsible for the payment of these costs on the following terms. The undiscounted balance of NRC together with any NRC in excess of $1500 may be amortized over the term of the original contract. Appealing the determination by the Zoning Administrator that Special Use Permit (SUP) #2017-07 requesting County approval to use a specified subject property for a “Mixed Use” land use had expired due to lack of construction activity within the one year time period. The subject properties are located on Rockfish Valley Highway in Afton, and are Tax Map Parcels #6-A-131 (8.126 acres) and 6-A-163D (2.811 acres). The subject property is zoned Agriculture (A-1). Consideration of a Special Use Permit application requesting County approval to build a single family home on property zoned B-1. The subject property is located at Tax Map Parcel #66-A-64 (4.1 acres) on Colleen Rd. The subject property is zoned B-1 and owned by Henry Fitzgerald. Consideration of concurrent Special Use Permit applications requesting County approval to use the specified subject property for Farm Winery Permanent Remote Retail and Restaurant use. The subject property is located at Tax Map Parcels #6-A-131 (8.126 acres) and #6-A-163D (2.811 acres) at 9485 Rockfish Valley Hwy. The subject property is zoned A-1 and owned by Rockfish Valley Events LLC. 80 Front Street, or the County Administrator’s Office 84 Courthouse Square Lovingston, Virginia, Monday through Friday, 9:00 a.m. to 5:00 p.m. EOE. Consideration of Rezoning (from R-1 to B-1) for use as professional offices. The subject property is located at Tax Map Parcel #4-A-37 (1.5 acres) located at 67 Afton Mountain Rd. The subject property is owned by Donna Small. SUP application #2018-04 requests approval to use the subject property for a retail use. The subject property is zoned M-1, is located at the corner of the intersection between 29 South and Cooperative Way; Tax Map Parcels #76-A-4C (1.5 acres) and a portion of #76-A-4A (3.8 acres), and is owned by Edward Harris and Marshall Mays Trustee. SUP application #2018-07 requests approval to use the subject property for a Vacation House use. The subject property is zoned R-1, is located at 267 Tanbark Drive; Tax Map Parcel #6-A-47A (3.461 acres) and is owned by Maureen and John Russell. Consideration of Rezoning (from R-1 to B-1) to use existing building as a retail store/restaurant and a concurrent Special Use Permit application requesting County approval to use the specified subject property for multi-family dwelling use. The subject property is located at Tax Map Parcel #7-A-4 (0.94 acres) located at 1889 Avon Rd. The subject property is owned by Curtis Bruguiere. Consideration of Rezoning (from R-1 to A-1) and concurrent Special Use Permit applications requesting County approval to use the specified subject property for Neighborhood Retail Store, Restaurant, and multi-family dwellings use. The subject property is located at Tax Map Parcel #7-A-4 (0.94 acres) located at 1889 Avon Rd. The subject property is owned by Curtis Bruguiere. Consideration of this Special Use Permit application requesting County approval to use the specified subject property for a Vacation House use. The subject property is located at Tax Map Parcel #6-A-47A (3.461 acres) located at 267 Tanbark Dr. The subject property is zoned R-1 and owned by Maureen and John Russell. Consideration of a Special Use Permit application requesting County approval to use the specified subject property for a retail use. The subject property is located at Tax Map Parcels #76-A-4C (1.5 acres) and a portion of #76-A-4A (3.8 acres) at the corner of the intersection between 29 South and Cooperative Way. The subject properties are zoned M-1 and owned by Edward Harris and Marshall Mays Trustee. Consideration of a Special Use Permit application requesting County approval to use the specified subject property for a retail use. The subject property is located at Tax Map Parcels #76-A-4C (1.5 acres) and a portion of #76-A-4A (3.8 acres) at the corner of the intersection between 29 South and Cooperative Way. (1.5 acres). The subject property is zoned M-1 and owned by Edward Harris. Furthermore, the Board of Supervisors hereby gives notice that a Public Hearing will start at 7:00 p.m., Tuesday, July 10th in the General District Courtroom on the third floor of the Nelson County Courthouse located at 84 Courthouse Square, Lovingston, for this same request. Consideration of a Special Use Permit application requesting County approval to use the specified subject property for a camping use. The subject property is located at Tax Map Parcel #64-A-232 off of Jenny’s Creek Rd. (32 acres), is zoned A-1, and owned by Forest Entertainment & Preservation Society LLC. Consideration of a Special Use Permit application requesting County approval to use the specified subject property for a camping use. The subject property is located at Tax Map Parcel #64-A-232 off of Jenny’s Creek Rd. (32 acres). The subject property is zoned A-1 and owned by Forest Entertainment & Preservation Society LLC. The Nelson County Board of Supervisors will conduct a public hearing on the proposed budget for the 2018/2019 fiscal year on Thursday, May 10, 2018, in the General District Courtroom within the County Courthouse located in Lovingston, Virginia to begin at 7:00 p.m. or as soon thereafter as possible, pursuant to Section 15.2-2506 of the Code of Virginia of 1950, as amended. A brief synopsis of the proposed budget which, except in the case of the school division budget, shall be for informative and fiscal planning purposes only, is presented herein below. At the public hearing comments from county citizens will be accepted on the general fund budget, the debt service fund budget, the capital fund budget, the school division’s budget, the textbook fund budget, and the Piney River water/sewer budget. A copy of these proposed budgets may be reviewed at the County Administrator’s Office during normal office hours. The Virginia Department of Transportation and the Board of Supervisors of Nelson County, in accordance with Section 33.2-331 of the Code of Virginia, will conduct a joint public hearing in the General District Courtroom of the Nelson County Courthouse, 84 Courthouse Square, Lovingston, Virginia at 7:00 pm on May 8, 2018. The purpose of this public hearing is to receive public comment on the proposed Secondary Six-Year Plan for Fiscal Years 2019 through 2024 and on the proposed Secondary Road System Improvement Priority List for Fiscal Year 2018. All projects in the Secondary Six-Year Plan that are eligible for federal funds will be included in the Statewide Transportation Improvement Program (STIP) and are programmed based on Commonwealth Transportation Board (CTB) priorities. Total Telefee Funds available for distribution are estimated to be approximately $299,568 for FY19-FY24, total State CTB Formula Unpaved Road Funds available are estimated to be approximately $839,321, and District Grant for Unpaved roads is estimated to be $1,957,825 for the six year plan period. 1 654 Falling Rock Dr. 1.0 Mi. E Rte. 657 to Rte. 661 1.90 Mi. 2 814 Campbell’s Mtn. Rd. 0.99 Mi. N. Rte. 56 to 1.99 Mi. N. Rte. 56 1.00 Mi. 3 617 Buck Creek Rd. 0.23 Mi. N Rte. 29 to Dead End 1.40 Mi. 4 625 Perry LN. Rte. 623 to Dead End 2.00 Mi. 5 645 Aerial Dr. Rte. 646 E to Rte. 646 W 0.20 Mi. 6 721 Greenfield Dr. Rte. 626 to 0.50 Mi. N Rte. 626 0.50 Mi. 1.82 Mi. W Rte. 678 0.75 Mi. 8 628 Rhue Hollow Rd. Rte. 764 to Dead End 0.22 Mi. 9 794 Rhue Hollow LN. Rte. 628 to Dead End 0.20 Mi. 10 678 Embly’s Gap Rd. 2.06 Mi. N Rte 676 to Rte. 666 1.64 Mi. 11 699 Carter Hill Rd. Rte. 807 to Rte. 680 1.29 Mi. 12 612 Bottom’s LN. Rte. 788 to Dead End 0.95 Mi. 13 623 Shield’s Gap Rd. Rte. 151 to Dead End 0.55 Mi. 14 650 High Peak LN. 0.50 Mi. N. Rte. 772 to Dead End 1.10 Mi. 15 654 Cedar Creek 2.0 Mi. W. Rte 655 to 3.0 Mi. W. Rte. 655 1.00 Mi. 16 653 Wilson Rd. Rte. 655 to Rte.710 2.83 Mi. 2.99 Mi. W. Rte. 56 1.00 Mi. 18 687 North Fork Rd. Rte. 56 to 1.0 Mi. W. Rte. 56 1.00 Mi. Copies of the proposed Plan and Budget and the Secondary Road Improvement Priority List may be reviewed at the Nelson County Administrator’s Office located at 84 Courthouse Square, Lovingston, VA 22949, and at the Appomattox VDOT Residency Office located at 331 Ferguson St. Appomattox, VA 24522. 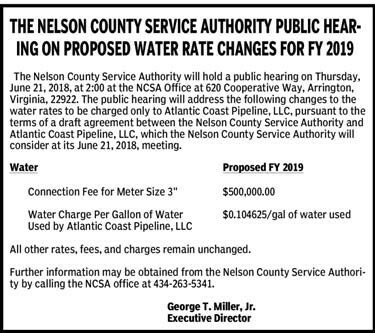 Persons requiring special assistance to attend or participate in this hearing should contact the Nelson County Administrator’s Office at (434) 263-7000. New Sec. 11-195 levies an admissions tax of 5% on the amount paid for admission to any spectator event occurring in Nelson County to be collected by the seller along with the price of admission or other charge. “Spectator event” includes, but is not limited to, the following:(1) Any motion picture, play, concert, opera, stage show, or other similar performances; (2) Any sporting or athletic contest, competition, exhibition, or event, except where the person admitted is participating in any such activity; (3) Any show, display, or exhibition; (4) Any lecture, talk, literary reading, or similar performance; (5) Any restaurant, bar, roof garden, winery, cabaret, or similar place furnishing a public performance for profit where music or other entertainment is offered and the patron is charged an admission fee or cover charge; and, (6) Any activity on a festival grounds or in connection with a temporary event. For persons admitted without charge, the tax shall be levied and collected based on the price charged to other attendees. New Sec. 11-196 provides that no admissions tax shall be levied on (a) Admissions charged for attendance at any event, the gross receipts of which go wholly to charitable purpose or purposes; or (b) Admissions charged for attendance at public or private elementary, secondary, and college-sponsored events, including events sponsored by school-recognized organizations; or, (c) Admissions charges of one dollar ($1.00) or less. New Sec. 11-197 provides that the amount of tax shall be added to the cost of admission by the seller, that such taxes collected by the seller shall be held in trust until remitted to the county, establishes procedures for the reporting and payment of the tax, and imposes record-keeping requirements on the seller. New Sec.11-198 provides for procedures and penalties for sellers failing to collect the tax, or who fail to make required reports and remittances. New Sec. 11-200 provides that each violation or failure to comply is a Class One Misdemeanor and that each such failure constitutes a separate offense. Following the hearing, the Planning Commission may vote to forward the amendments to the Board of Supervisors with a recommendation for adoption, or with a recommendation for adoption with modifications, for review and action by the Board, which may adopt a resolution or ordinance to approve, modify, or reject an item. 80 Front Street, Lovingston, Virginia, Monday through Friday, 9:00 a.m. to 5:00 p.m. Telephone inquiries may also be directed to the Dept. of Planning & Zoning, (434) 263-7090, or toll free at 888-662-9400, selections 4 and 1. Nelson County does not discriminate on the basis of handicapped status in admission or access to its programs and activities. Accommodation will be made for handicapped persons upon advance request. Consideration of a Special Use Permit application requesting County approval to use the specified subject property for a mixed retail store/restaurant use. The subject property is located at 9585 Rockfish Valley Hwy in Afton, Tax Map Parcel #6-A-131 (16.8 acres). The subject property is zoned A-1 and owned by Todd Rath. Consideration of a Special Use Permit application requesting County approval to use the specified subject property for a campground use. The subject property is located at Tax Map Parcel #80-A-52 off of Rt. 626 (29.03 acres). The subject property is zoned A-1 and owned by Forest Entertainment & Preservation Society LLC. Furthermore, the Board of Supervisors hereby gives notice that a Public Hearing will start at 7:00 p.m., Thursday, March 13th in the General District Courtroom on the third floor of the Nelson County Courthouse located at 84 Courthouse Square, Lovingston, for this same request. 2215 Spruce Creek Lane, Nellysford, Virginia – owned by Hershel & Darlene Spears, and further identified as Tax Map #20-A-61. Consideration of a request from Atlantic Coast Pipeline LLC for a Variance to construct a pipeline across a floodplain in conformance with Article 10 of the Nelson County Zoning Code for construction of a natural gas pipeline across property owned by Jonathan & Janet Geldzahler, Tax Map #20-A-59A. 1694 Rockfish Valley Hwy, Nellysford, VA – owned by Wanda & Davis Paige, and further identified as Tax Map #21-4-5. 215 Flying Eagle Ct, Nellysford, VA – owned by Robert & Barbara Fuhrman, and further identified as Tax Map #21-13-14. 1261 Gullysville Ln, Rockfish, VA – owned by Shenandoah Properties LLC, and further identified as Tax Map #32-A-19. Consideration of a request from Atlantic Coast Pipeline LLC for a Variance to construct a pipeline across a floodplain in conformance with Article 10 of the Nelson County Zoning Code for construction of a natural gas pipeline across property owned by James David Matthews, Tax Map #33-A-34. Consideration of a request from Atlantic Coast Pipeline LLC for a Variance to construct a pipeline across a floodplain in conformance with Article 10 of the Nelson County Zoning Code for construction of a natural gas pipeline across property owned by Commonwealth of Virginia, Board of Game and Inland Fisheries, Tax Map #81-A-42A. Winery: An establishment where wine is made, bottled, and/or stored for distribution and which may contain accessory facilities for retail sales and tastings. Furthermore, the Board of Supervisors hereby gives notice that a Public Hearing will start at 7:00 p.m., Thursday, November 16th in the General District Courtroom on the third floor of the Nelson County Courthouse located at 84 Courthouse Square, Lovingston, for this same request. Consideration of a Special Use Permit application requesting County approval to use the specified subject property for a public garage. The subject property is located at 99 Morse Lane in Arrington. Tax Map Parcel #76-10-3 (3.275 acres), owned by Helen and David Park. The subject property is zoned Agricultural (A-1). Consideration of a Rezoning application requesting County approval to use the specified subject property for a landscaping business. The subject property is located at 20 Hedge Lane in Afton. Tax Map Parcel #6-A-102A (4 acres), owned by Michael Penny. The subject property is zoned Light Industrial (M-1) and seeks to be zoned Industrial (M-2). Following these public hearings, the Planning Commission may vote to forward the applications to the Board of Supervisors (BOS) (with a recommendation for approval; a recommendation for approval with recommended conditions; or a recommendation for denial) for action by the Board. Prior to taking any vote to approve, modify, or reject the application, the BOS will also conduct a public hearing to be held on Thursday, November 16, 2017 at 7:00 p.m. in the General District Courtroom. Consideration of a Class C Tower Permit application requesting County approval to use the specified subject property for an “85’ steel monopole tower painted brown”. The subject property is located in Wintergreen on Waterworks Ln. Tax Map Parcel #11-A-2 (359.4 acres), owned by Wintergreen Property Owners Association. The subject property is zoned Residential Planned Community (RPC). Following this public hearing, the Planning Commission may vote to forward the application to the Board of Supervisors (BOS) (with a recommendation for approval; a recommendation for approval with recommended conditions; or a recommendation for denial) for action by the Board. Prior to taking any vote to approve, modify, or reject the application, the BOS will also conduct a public hearing to be held on Tuesday, September 12, 2017 at 7:00 p.m. in the General District Courtroom. County approval is requested to use subject properties for “Campground” land use. The properties are all zoned Agricultural (A-1) and are located in Lovingston off of Fortune’s Cove Lane, and include: Tax Map Parcel #57-A-3A1(63.68 acres), owned by La Abra Farm and Winery; and Tax Map Parcel #57-A-3L(15.90 acres), owned by Al Weed III. 1. Class C Tower Permit #2017-12 – Hunting Lodge Rd. / SBA Communications Corp. Consideration of a Class C Tower Permit application requesting County approval to use the specified subject property for a “130’ Self Support Tower”. The subject property is located in Shipman off of Hunting Lodge Rd, Tax Map Parcel #81-6-2 (84.35 acres), owned by Edward and Patricia Williams. The subject property is zoned Agricultural (A-1). Consideration of a Class C Tower Permit application requesting County approval to use the specified subject property for a “130’ steel monopole tower”. The subject property is located in Roseland at 398 Beech Grove Rd, Tax Map Parcel #31-A-51A (5.67 acres), owned by William C. Parrish. The subject property is zoned Agricultural (A-1). Consideration of a Special Use Permit (SUP) application requesting County approval to use a specified subject property for a “Mixed Use” land use. The subject properties are located on Rockfish Valley Highway in Afton, and are Tax Map Parcels #6-A-131 (8.126 acres) and 6-A-163D (2.811 acres). The subject property is zoned Agriculture (A-1). Following these public hearings, the Planning Commission may vote to forward one or more applications to the Board of Supervisors (BOS) (with a recommendation for approval; a recommendation for approval with recommended conditions; or a recommendation for denial) for action by the Board. Prior to taking any vote to approve, modify, or reject any of these applications, the BOS will also conduct a public hearing for each on August 8, 2017 at 7:00 PM in the General District Courtroom of the Courthouse in Lovingston. Special Use Permit (SUP) application #2017-05 requests approval for an “Outdoor Entertainment Venue” land use. The subject property is zoned Residential (R-1), is located at 190 Rockfish School Lane in Afton, is a 10.109-acre parcel identified as Tax Map Parcel #12-A-55 owned by Rockfish Valley Community Center. Rezoning application #2017-03 requests approval for rezoning of property located in Piney River at 3853 Patrick Henry Highway from Residential (R-1) and Agricultural (A-1) to Business (B-1) to “Construct a new commercial retail store.” The subject property is Tax Map Parcel #64-A-93 (0.96 acres) and is owned by Lynn and Robert Payne. Following these public hearings, the Board may vote to approve (with or without conditions), to modify, disapprove, or defer action on any of these applications. The Nelson County Board of Supervisors will conduct a public hearing on the proposed budget for the 2017/2018 fiscal year on Thursday, May 25, 2017, in the General District Courtroom within the County Courthouse located in Lovingston, Virginia to begin at 7:00 p.m. or as soon thereafter as possible, pursuant to Section 15.2-2506 of the Code of Virginia of 1950, as amended. A brief synopsis of the proposed budget which, except in the case of the school division budget, shall be for informative and fiscal planning purposes only, is presented herein below. At the public hearing comments from county citizens will be accepted on the general fund budget, the debt service fund budget, the capital fund budget, the school division’s budget, the textbook fund budget, the Piney River water/sewer budget, and the courthouse project fund budget. A copy of these proposed budgets may be reviewed at the County Administrator’s Office during normal office hours. The Virginia Department of Transportation and the Board of Supervisors of Nelson County, in accordance with Section 33.2-331 of the Code of Virginia, will conduct a joint public hearing in the General District Courtroom of the Nelson County Courthouse, 84 Courthouse Square, Lovingston, Virginia at 7:00 pm on Thursday, May 25, 2017. The purpose of this public hearing is to receive public comment on the proposed Secondary Six-Year Plan for Fiscal Years 2018 through 2023 and on the proposed Secondary Road System Improvement Priority List for Fiscal Year 2018. All projects in the Secondary Six-Year Plan that are eligible for federal funds will be included in the Statewide Transportation Improvement Program (STIP) and are programmed based on Commonwealth Transportation Board (CTB) priorities. Total Telefee Funds available for distribution are estimated to be approximately $307,482 for FY18-FY23, total State CTB Formula Unpaved Road Funds available are estimated to be approximately $1,211,346, and District Grant for Unpaved roads is estimated to be $1,455,347 for the six year plan period. 1 756 Wright’s Ln. Rte. 623 to Dead End 0.90 Mi. 2 634 Old Robert’s Rd. Rte. 619 to Rte. 754 1.70 Mi. 3 654 Cedar Creek Rd. 1.0 mi W Rte. 655 to 2.0 Mi. W Rte. 655 1.00 Mi. 4 680 Cub Creek Rd. 0.51 W Rte. 699 to 2.99 Mi. W Rte. 699 2.48 Mi. 5 654 Falling Rock Dr. 1.0 Mi. E Rte. 657 to Rte. 661 1.90 Mi. 6 814 Campbell’s Mtn. Rd. 0.99 Mi. N. Rte. 56 to 1.99 Mi. N. Rte. 56 1.00 Mi. 7 617 Buck Creek Rd. 0.23 Mi. N Rte. 29 to Dead End 1.40 Mi. 8 625 Perry Ln. Rte. 623 to Dead End 2.00 Mi. 9 653 Wilson Rd. Rte. 655 to Rte.710 2.83 Mi. 10 645 Aerial Dr. Rte. 646 E to Rte. 646 W 0.20 Mi. 11 721 Greenfield Dr. Rte. 626 to 0.50 Mi. N Rte. 626 0.50 Mi. Pursuant to §20-20-C of Appendix A, Zoning Ordinance of the Code of Nelson County, a public hearing will be held on November 8, 2016 at 2:00 PM in the General District Courtroom in the Courthouse in Lovingston, Virginia. Public input will be received on T-Mobile’s request for modification from the Board of Supervisors pursuant to Z.O. Article 20, Section 17 B-2-(v), which requires a minimum fall area setback distance between the base of a temporary tower and adjoining property lines of 150% of the temporary tower height. T-Mobile proposes to install and operate a temporary sixty (60) foot tall “Cell on Wheels” (COW) telecom facility at 21 Fern Circle, Tax Map #11F-Open, and modification from the required ninety (90) foot fall area setback is being requested. The property’s present use is the Fern Circle utility easement containing two (2) water storage tanks, multiple telecom towers, and related facilities. Pursuant to §§15.2-5431.25 (B) of the Virginia Wireless Service Authority Act and Nelson County Broadband Authority adopted resolution R2016-06, a public hearing will be held at 6:00 PM on January 10, 2017 in the General District Courtroom of the Courthouse, Lovingston VA.
• Tier 1 – Transport service from the service provider’s port in the data center to a single customer location. Traffic is untagged at the customer. Circuit is typically asymmetric and priority is set at Best Effort across the core network. NCBA will observe a maximum 32:1 split. • Tier 2 – Transport service from the carrier or provider’s port in the colo to a single customer location. Traffic is untagged at the customer. GPON circuits are symmetric and the priority is set higher than Tier 1 for better performance across the core network. NCBA will observe a maximum 16:1 split on this service tier for GPON connections. Active Ethernet connections are symmetric and have a higher traffic priority than Tier 1 services. An example of this is a package of Internet access for a business with regular use of videoconferencing, heavy cloud-based service use, and large file uploads. • Tier 3 – Transport service between the carrier or provider’s port in the colo as well as between multiple customer locations (fee applies for each end-point outside of provider’s NNI). Passed traffic can be tagged or untagged as well as supporting Q-in-Q. The circuit is symmetric and traffic has the highest priority across the core network. An example of this would be a transparent LAN service to link two customer locations. Non-recurring charges (NRC) are those costs incurred in connection with the installation of the fiber drop and ONT. The customer will be responsible for the payment of these cost on the following terms. All rentals are based on a space available basis. Rental will include access to one 20 amp, 120 volt circuit. Redundant CC power (-48 volt) will be available as well. The Colocation charges include up to 20 amps of DC power. Additional DC power, subject to availability, will be priced at $6.25 per amp in 10 amp increments. Top thirty feet in 10 feet sections $275 per antenna for first three antennas (includes cables and ancillary equipment such as tower mounted amplifiers) $150 per additional antenna installed by the same lessee. Next thirty feet in 10 foot sections $175 per antenna for first three antennas (includes cables and ancillary equipment such as tower mounted amplifiers) $90 per additional antenna installed by the same lessee. All tower access charges are in addition to a site access fee of $200 per month. Site access fee entitles lessee access to electric power (contracted for by lessee) and ground space for cabinet (10 square feet). Shelter colocation charges and local transport charges are additional as are lease space for placing shelters, generators or other equipment. Items not specifically addressed will be priced on an individual basis. Preference will be given to providers wishing space higher on the towers. The NCBA may limit the size of antennas or duration of leases for antennas located below the top 80 feet. Tower leases will be accepted based on maximum allowable loading of a tower. If, in the sole discretion of the NCBA, an analysis of the structural integrity of the tower is deemed necessary, then the costs of the analysis will be borne by the lessee. WIRELESS INTERNET SERVICE PROVIDERS (WISPs) may enter a master lease for tower space on all NCBA owned or operated towers. The tower access charge under the master lease (the “Master Tower Access Charge”) shall be $2,000 per month. For each tower the NCBA adds to its system subsequent to the adoption of this rate schedule, the Master Tower Access Charge shall automatically increase by $250 per month. The Master Tower Access Charge also includes any colocation charges in available shelters and cabinets located at the tower sites as well as 10 square feet of ground space for lessee’s cabinet. The location of the tower space leased pursuant to this paragraph shall be determined in the sole discretion of the NCBA. If, in the sole discretion of the NCBA, an analysis of the structural integrity of a tower is deemed necessary, then the costs of the analysis will be borne by the lessee. These rates apply to towers operated by the NCBA. Rates for towers leased by the NCBA may be subject to approval by the lessor. Rates are firm for a contract or lease term which does not exceed five years. For contract and lease terms exceeding five years, the contract or lease shall provide for either of the following payment adjustments: (a) if an extension of an original term is month-to-month or year-to-year, then beginning with the first month of the extension, payment shall be increased 3%, and thereafter by 3% on each subsequent annual anniversary, or (b) if the term is for five years with a right of renewal in five year increments, then upon each renewal payment shall be increased 12%. Any sum due NCBA and unpaid by the due date shall be assessed a 10% penalty and carry interest at the rate of 12% per annum. Pursuant to §15.2-1427 of the Code of Virginia 1950 as amended and Board of Supervisors Resolution R2016-63, a public hearing will be held on October 11, 2016 at 7:00 PM in the General District Courtroom in the Courthouse in Lovingston, Virginia. The purpose of the public hearing is to receive public input on Class C tower permit #2016-08, Site CV221 at 12979 Thomas Nelson Hwy; Shentel/P. Wright. The application is for replacement of an existing 97.5 ft. wooden pole with a 130 ft. metal monopole painted brown with flush mount antennas and associated ground equipment. The wireless service facility is located at 172 Davis Creek Lane, Lovingston VA 22949, tax parcel 45-A-40 Zoned A-1. Sec. 11-23. Restrictions and conditions. (1) Such real estate shall be owned by, and be occupied as the sole dwelling of anyone (i) at least 65 years of age or (ii) found to be permanently and totally disabled as defined below. A dwelling jointly held by a husband and wife, with no other joint owners, may qualify if either spouse is 65 or over or is permanently and totally disabled. For purposes of this division, the term “permanently and totally disabled” shall mean unable to engage in any substantial gainful activity by reason of any medically determinable physical or mental impairment or deformity which can be expected to result in death or can be expected to last for the duration of such person’s life. (2) For purposes of this division, the applicant must be (i) at least age 65 as of May 15 of the taxable year for which an application is made or (ii) is permanently and totally disabled. Under subparagraph (1), real property owned and occupied as the sole dwelling of an eligible applicant includes real property (i) held by the applicant alone or in conjunction with his spouse as tenant or tenants for life or joint lives, (ii) held in a revocable inter vivos trust over which the applicant or the applicant and his spouse hold the power of revocation, or (iii) held in an irrevocable trust under which an applicant alone or in conjunction with his spouse possesses a life estate or an estate for joint lives or enjoys a continuing right of use or support. The exemption is not applicable to any interest held under a leasehold or term of years. For purposes of this division, any reference to real estate shall include manufactured homes. The income of owners’ relatives living in the dwelling and providing bona fide caregiving services to the owner whether such relatives are compensated or not, shall not be counted towards the income limit set forth in the preceding subparagraph (3). In accordance with the Code of Virginia, 1950, as amended, §15.2-1427, §15.2-2204, §15.2-4303 §15.2-4307, and §15.2-4309, the Nelson County Board of Supervisors will hold a public hearing at 7:00 p.m., Tuesday, September 13, 2016 in the General District Courtroom of the Nelson County Courthouse located at 84 Courthouse Square, Lovingston. The purpose of said public hearing is to receive public input on an Ordinance proposed for passage that would include application #2016-01 requesting voluntary expansion of the existing Greenfield AFD by 13.88 total acres, pursuant to the Chapter 9 “Planning and Development,” Article V, “Agricultural and Forestal Districts” of the Code of Nelson County. Following the public hearing, action by the Board may include taking a vote to approve, modify, or reject this application. Pursuant to §15.2-1800 and §15.2-1427 of the Code of Virginia 1950 as amended, the Nelson County Board of Supervisors will conduct a public hearing to be held on September 13, 2016 at 7:00 PM in the General District Courtroom in the Courthouse in Lovingston, Virginia to receive public input on the proposed disposition of County Property located at 393 Front Street, Lovingston, Virginia 22949, Tax Map #58-A-38a, known as the former Lovingston Healthcare Center. 4. Lease purchase to Region Ten Community Services Board for an assisted living facility primarily for Region Ten CSB clientele, with one wing of the building to include individuals who are not necessarily associated with Region Ten Services. The proposed Article provides regulations designed to address temporary uses in districts where such uses would not otherwise be permissible, establishes criteria for the approval or disapproval of such temporary uses, and provides requirements for the permitting and conduct of such uses. The Article also requires the issuance of a Special Use Permit for properties where the intended use envisions large scale events, and provides for the regulation of out-of-door activities conducted as an accessory use to certain permitted commercial uses. The Article is not intended to regulate, and does not regulate, the traditional non-commercial use of property by its owners. 24-1. Definitions are created for Agritourism Activity; Festival Grounds; Out-of-Door, Accessory Use; Temporary Event; Temporary Event, Historical Property; Temporary Event, Non-Profit; and, Temporary Event, Social. Agritourism Activity: any activity carried out on a farm or ranch engaged in bona fide Agricultural Operations that allows members of the general public, for recreational, entertainment, or educational purposes, to view or enjoy rural activities, including farming, wineries, ranching, historical, cultural, harvest-your-own activities, or natural activities and attractions whether or not the participant paid to participate in the activity. Festival Grounds: The use of land for the hosting and operation of Category 3 Temporary Events, and the construction of structures or other improvements associated with Category 3 Temporary Events. The minimum acreage is 250 acres. Contiguous parcels under the same or different ownership or control may be aggregated to attain the minimum acreage. Out-of-Door, Accessory Use: The following out-of-door activities are accessory uses to a Banquet Hall, Conference Center, Corporate Training Center, Restaurant, Brewery, and Distillery: receptions, dining, and entertainment, such as musical, or other cultural performances, which (i) are conducted in connection with the primary permitted use, (ii) do not involve amplified sound later than 9:00 p.m. on Sundays through Thursdays or later than 10:00 p.m. on Fridays or Saturdays, and (iii) hosts no more than 500 attendees at any one time during the activity. Unless otherwise specified in (ii), all such accessory activities are limited to 10:00 p.m. on Sundays through Thursdays, and are limited to 11:00 p.m. on Fridays and Saturdays. Temporary Event: The temporary use of property that is not otherwise a by-right use or use permitted by special or conditional use permit. Temporary Event, Historical Property: An event such as historical reenactments, living history, home tours conducted in connection with a property of historical or natural value when there is no or only nominal admission. Temporary Event, Non-Profit: An event conducted by local non-profit community service organizations. agritourism activity venue, which is not open to the general public, to which attendance does not exceed 300 people, and for a fee is charged for the use of the property. 24-2. A Temporary Event Permit is required for Temporary Events defined in this subsection as either Category 1, 2, or 3. 24-2-A. Lists Temporary Events exempted from Temporary Event Permit requirements and fees: Private non-commercial functions conducted on the property of the host, Social Temporary Events where permitted by right, Historical Property Temporary Events, Non-Profit Temporary Events having or projecting no more than 500 attendees at any time during the event, Athletic and sporting events conducted on sites approved for such events, Political gatherings, Religious gatherings, Out-of-Door Accessory Uses, and Farm winery and Agritourism activities which by virtue of the number of attendees, size and location of property, or hours of conduct cause any substantial impact(s) on the health, safety, or general welfare of the public. 24-2-B. Provides that a Category 1 Temporary Event is any event which is neither an otherwise permitted use nor exempt and (i) for which admission is charged or at which goods and services are sold, having or projecting no more than 500 attendees at any time during the event, or, (ii) is a Non-Profit Temporary Event having or projecting more than 500 attendees and less than 1,000 attendees at any time during the event, or, (iii) is a Farm winery activity or Agritourism activity which by virtue of the number of attendees, size and location of property, or hours of conduct cause any substantial impact(s) on the health, safety, or general welfare of the public, and having or projecting less than 1,000 attendees at any time during the event. Contains limitations on duration and amplified sound. 24-2-C. Provides that a Category 2 Temporary Event is any event which is neither an otherwise permitted use nor exempt and (i) for which admission is charged or at which goods and services are sold, having or projecting more than 500 attendees but less than 10,000 attendees, or (ii) Non-Profit Temporary Events having or projecting more than 1,000 attendees but less than 10,000 attendees at any time during the event, or (iii) Farm winery activities or Agritourism activities which by virtue of the number of attendees, size and location of property, or hours of conduct cause any substantial impact(s) on the health, safety, or general welfare of the public, and having or projecting more than 1,000 attendees but less than 10,000 attendees at any time during the event. Contains limitations on duration and amplified sound. 24-2-D. Addresses structures used for either a Category 1 or 2 event and their required permitting. Contains provisions for removal of temporary structures. 24-2-E. Defines a Category 3 Temporary Event as any event having or projecting more than 10,000 attendees and requires a Special Use Permit for Festival Grounds, provides for review of a Festival Grounds Special Use Permit by the Board of Supervisors every five (5) years and contains limitations on duration and amplified sound. 24-2-F. For the purposes of Article 24, defines “applicant” to include the members of an applicant’s immediate family or an affiliated business entity relationship and lists factors. 24-3A and B. Lists nine factors to be considered by the Planning and Zoning Director when determining whether a Temporary Event Permit will be issued and limitations the Director may impose. 24-3-C. Permits the Director to issue a single Temporary Event Permit for more than one Temporary Event. 24-3-D. Establishes Temporary Event Permit application requirements and fees. 24-3-E. Permits the Director to approve modifications to the Temporary Event Permit for unforeseen circumstances outside of the event promoter’s control or causation. Community Center: A building and grounds used for recreation, social, educational, health, or cultural activities open to the public or a portion of the public, owned and operated by a public or private non-profit group or agency. The activities may involve leasing of space for the sale of goods and services, offices, and Temporary Events in conjunction with Article 24 of this ordinance and subject to applicable zoning district regulations. The sale of goods and services may be carried on a for-profit basis or for charitable non-profit purposes by the owner or the owner’s approved lessee or licensee. Community Center uses, structures, and activities are subject to site plan approval. Signage conveying information about permissible Temporary Events and/or a permitted Outdoor Entertainment Venue is permissible, subject to applicable regulations and approval requirements contained elsewhere in this Ordinance. There can be no other exterior indication of non-temporary commercial activities at the center, such as outside storage, sales area, or signage, except for a principal sign identifying the center, a single changeable letter sign, and additional small wayfinding and directional signs which may include identification of tenants. Outdoor Entertainment Venue: The non-temporary use of any land, including the erection or use of non-temporary structure(s) or the installation of non-temporary infrastructure, for the hosting and operation of Category 1 and Category 2 Temporary Events, Exempt Events, or other entertainment activities for cultural, artistic, social, or recreational purposes. Section (a) authorizes the Sheriff to dispose of unclaimed personal property following reasonable attempts to notify the rightful owner of the property. Such disposition includes: public sale and or retained use by the department. This section also defines “unclaimed personal property” and provides for public notice requirements prior to disposition. Section (b) provides for the optional disposition of unclaimed bicycles, electric power-assisted bicycles, mopeds, and electric personal assistive mobility devices that go unclaimed for more than 30 days by public sale or donation to a charitable organization. This section also provides for the circumstances under which these items found and delivered to the Sheriff’s Department can be given to the finder. Section (c) provides for the optional disposal or destruction of unclaimed firearms or other weapons in possession of the Sheriff inclusive of destruction after 120 days or donation to the Department of Forensic Science, upon agreement of the Department. This section also defines “unclaimed firearms and other weapons” and provides for public notice requirements prior to disposal or destruction. The full text of the proposed Ordinance is available for review in the County Administrator’s Office, 84 Courthouse Square Lovingston, Virginia, M-F, 9am to 5pm. For more information, call (434) 263-7000. EOE. Consideration of a Special Use Permit (SUP) application made pursuant to Zoning Ordinance Article 5 (“Residential District R-1”), Section 5-1-2a (“Double-wide mobile home mounted on a permanent concrete or block foundation”). The SUP is a request to replace a former single-family dwelling, which was damaged in a structure fire, with a double-wide manufactured home. The subject property is a 2.0-acre parcel zoned Residential (R-1) and Agricultural (A-1) and is located in Afton at 1617 Avon Road. Copies of the above files are available for review in the Office of the County Administrator 84 Courthouse Square, Lovingston and in the Dept. of Planning & Zoning office, 80 Front Street, Lovingston, Virginia M-F 9am to 5pm. Telephone inquiries may also be directed to the Dept. of Planning & Zoning, (434) 263-7090, or toll free at 888-662-9400, selections 4 and 1. The Nelson County Board of Supervisors will conduct a public hearing on the proposed budget for the 2016/2017 fiscal year on Thursday, May 26, 2016, in the General District Courtroom within the County Courthouse located in Lovingston, Virginia to begin at 7:00 p.m. or as soon thereafter as possible, pursuant to Section 15.2-2506 of the Code of Virginia of 1950, as amended. A brief synopsis of the proposed budget which, except in the case of the school division budget, shall be for informative and fiscal planning purposes only, is presented herein below. At the public hearing comments from county citizens will be accepted on the general fund budget, the debt service fund budget, the capital fund budget, the school division’s budget, the textbook fund budget, the Piney River water/sewer budget, and the courthouse project fund budget. A copy of these proposed budgets may be reviewed at the County Administrator’s Office during normal office hours. The Virginia Department of Transportation and the Board of Supervisors of Nelson County, in accordance with Section 33.2-331 of the Code of Virginia, will conduct a joint public hearing in the General District Courtroom of the Nelson County Courthouse, 84 Courthouse Square, Lovingston, Virginia at 7:00 pm on Tuesday, May 26, 2016. The purpose of this public hearing is to receive public comment on the proposed Secondary Six-Year Plan for Fiscal Years 2017 through 2022 and on the proposed Secondary Road System Improvement Priority List for Fiscal Year 2017. All projects in the Secondary Six-Year Plan that are eligible for federal funds will be included in the Statewide Transportation Improvement Program (STIP) and are programmed based on Commonwealth Transportation Board (CTB) priorities. Total Telefee Funds available for distribution are estimated to be approximately $286,164 for FY17-FY22 and total State CTB Formula Unpaved Road Funds available are estimated to be approximately $1,526,899 for the six year plan period. 1 640 Wheeler’s Cove Rd. Rte. 623 to Rte. 620 0.70 Mi. 2 756 Wright’s Ln. Rte. 623 to Dead End 0.90 Mi. 3 634 Old Robert’s Rd. Rte. 619 to Rte. 754 1.70 Mi. 4 654 Cedar Creek Rd. 1.0 mi W Rte. 655 to 2.0 Mi. W Rte. 655 1.00 Mi. 5 680 Cub Creek Rd. 0.51 W Rte. 699 to 2.99 Mi. W Rte. 699 2.48 Mi. 6 654 Falling Rock Dr. 1.0 Mi. E Rte. 657 to Rte. 661 1.90 Mi. 7 814 Campbell’s Mtn. Rd. 0.99 Mi. N. Rte. 56 to 1.99 Mi. N. Rte. 56 1.00 Mi. 8 617 Buck Creek Rd. 0.23 Mi. N Rte. 29 to Dead End 1.40 Mi. 9 625 Perry Ln. Rte. 623 to Dead End 2.00 Mi. 10 653 Wilson Rd. Rte. 655 to Rte.710 2.83 Mi. 11 645 Aerial Dr. Rte. 646 E to Rte. 646 W 0.20 Mi. 12 721 Greenfield Dr. Rte. 626 to 0.50 Mi. N Rte. 626 0.50 Mi. Persons requiring special assistance to attend or participate in this hearing should contact the VDOT at (434) 352-7135 or the Nelson County Administrator’s Office at (434) 263-7000. Consideration of a Special Use Permit (SUP) application made pursuant to Zoning Ordinance Article 5 (“Residential District R-1”), Section 5-1-2a (“Double-wide mobile home mounted on a permanent concrete or block foundation”). Specifically, the applicant requests approval to replace a former single-family dwelling which was damaged in a structure fire with a double-wide manufactured home. The subject property is a 2.0-acre parcel located in Afton at 1617 Avon Road; it is further identified as Tax Map Parcel #7-A-25 and is zoned Residential (R-1) and Agricultural (A-1). Following the hearing, the Planning Commission may vote to forward this SUP application to the Board of Supervisors (with a recommendation for approval; a recommendation for approval with recommended conditions; or a recommendation for denial) for action by the Board. Prior to taking any vote to approve, modify, or reject this application, the Board of Supervisors will also conduct a public hearing. A date for the public hearing by the Board of Supervisors has not yet been determined. 2. Class C Communications Tower Permit #2016-01 (CV821 – Greenfield – 5029 Rockfish Valley Hwy): Proposed Equipment upgrades at an existing communication facility involving equipment replacement and additions and increased tower height. 3. Class C Communications Tower Permit #2016-02 (CV822 – Lodebar – 622 Hearthstone Ln): Proposed equipment upgrades at an existing communication facility involving equipment replacement and additions and increased tower height due to a proposed 5.3’ tall lightning rod. The full text of the proposed ordinance amendment and the complete communications tower applications are available for public inspection in the Office of the County Administrator, 84 Courthouse Square and the Department of Planning & Zoning, 80 Front Street, both in Lovingston, VA, 22949, M-F, 9:00 a.m. to 5:00 p.m. For more information, call County Administration, (434) 263-7000, the Dept. of Planning & Zoning, (434) 263-7090, or toll free, (888) 662-9400, selections 4 and 1. Following the hearing, the Planning Commission may vote to forward the amendments to the Board of Supervisors with a recommendation for adoption, or with a recommendation for adoption with modifications, for review and action by the Board, which may adopt a resolution or ordinance to approve, modify, or reject an item. The Board of Supervisors must first conduct a properly-advertised public hearing before taking a vote to adopt, reject, or adopt with modification the proposed amendments. The definition or redefinition of numerous land uses related to transient lodging and dwellings in Article 2, Definitions as follows: “Bed and breakfast, Class A,” “Bed and breakfast, Class B,” “Boardinghouse,” “Campground,” “Dwelling,” “Dwelling, single-family detached,” “Home occupation, class A,” “Home occupation, class B,” “Hotel,” “Tent,” “Transient,” “Transient lodging,” “Travel Trailer,” and “Vacation House.” The existing “Boardinghouse, tourist home” and “Tourist home” definition would be eliminated. Section 4-1 Uses – Permitted by right. 5-1-18 Bed and Breakfast, Class B, if the subject property contains more than one zoning classification with a majority portion of the subject property zoned Agricultural A-1. 5-1-19 Vacation House, if the subject property contains more than one zoning classification with a majority portion of the subject property zoned Agricultural A-1. 3. Other uses as permitted in Residential Districts R-1 and in Section 7-5-1(b); except that Vacation House shall be a permissible by-right use in the SR Sector of the RPC District and shall not require a Special Use Permit. Section 8B-1 Uses – Permitted by right. The full text of the proposed ordinance amendments are available for public inspection in the Office of the County Administrator, 84 Courthouse Square and the Department of Planning & Zoning, 80 Front Street, both in Lovingston, VA, 22949, M-F, 9:00 a.m. to 5:00 p.m. For more information, call County Administration, (434) 263-7000, the Dept. of Planning & Zoning, (434) 263-7090, or toll free, (888) 662-9400, selections 4 and 1. In accordance with Code of Virginia §2.2-3707, this public notice is provided to inform the public that the Nelson County Planning Commission will be conducting a Work Session on Wednesday, February 24th beginning at 6:00 pm in the General District Courtroom, on the 3rd Floor of the County Courthouse, Lovingston. The purpose of this Work Session special meeting is to continue the Commission’s review of proposed amendments to the Nelson County Zoning Ordinance regarding the definition and certain regulations designed to: address temporary uses in districts where such uses would not otherwise be permissible; establish certain criteria for the approval or disapproval of such temporary uses; and provide requirements for the permitting and conduct of such uses. The proposed Article would also require the issuance of a Special Use Permit for properties where the intended use envisions large scale events, and would provide for the regulation of out-of-door activities conducted as an accessory use to certain permitted commercial uses. The proposed Article is not intended to regulate, and would not regulate, the traditional non-commercial use of property by its owners. Specifically, the proposed amendments were referred to the Planning Commission on August 11, 2015 by the Board of Supervisors in Resolution R2015-68 – “Temporary Events, Festival Grounds, and Out-of-Doors Accessory Uses.” These proposed amendments would affect the following zoning districts: Agricultural A-1, Business B-1, Business B-2, and Service Enterprise SE-1. The Planning Commission conducted a public hearing on these proposed amendments on January 27, 2016. Copies of the proposed Ordinance amendments are available for public inspection in the Department of Planning & Zoning, 80 Front Street, and in the Office of the County Administrator, 84 Courthouse Square, both in Lovingston, VA, 22949, from Monday through Friday, between 9:00 a.m. and 5:00 p.m. Telephone inquiries may also be directed to the Dept. of Planning & Zoning, (434) 263-7090, or toll free at 888-662-9400, selections 4 and 1. The proposed Ordinance amendments will also be available for download on the County Calendar under the February 24th Planning Commission Work Session event at http://www.nelsoncounty-va.gov/events/category/county-calendar/2014-08/. Consideration of a Special Use Permit application made pursuant to Zoning Ordinance §4-1-4a (“banquet hall”). Specifically, the applicant wishes to “allow for subdivision of property to be used as a banquet hall”. The subject property is located in Schuyler at 1981 Salem Road; it is further identified as Tax Map Parcel #61-A-23 and is zoned Agricultural (A-1). In accordance with Volume 3A, Title 15.2, Counties, Cities and Towns, of the Code of Virginia, 1950, as amended, and pursuant to §15.2-2204, and §15.2-1427 the Nelson County Board of Supervisors will hold a public hearing at 7:00 p.m., Tuesday January 12, 2016 in the General District Courtroom on the third floor of the Nelson County Courthouse located at 84 Courthouse Square, Lovingston, Virginia. The purpose of said public hearing is to receive citizen input on Special Use Permits for the Spruce Creek Resort & Market. The subject property is identified as Tax Map Parcels #21-A-35; -36, is zoned Agricultural (A-1) and consists of 98.21 acres located on Rockfish Valley Highway. The Special Use Permit applications #2015-10 to #2015-13 seek approval to build a small grocery/market for the sale of local foods and goods pursuant to Zoning Ordinance §4-1-35a (“retail store, neighborhood”); build a banquet hall to be used for weddings, meetings, etc.…and provide lodging cottages & provisions for overnight stays pursuant to §4-1-13a (“conference center”); build a small spa with a few cabins for guest use and public use pursuant to §4-1-44a (“activity center”); and build a restaurant on property zoned A-1 pursuant to §4-1-34a (“restaurant”). Copies of the applications are available for public inspection in the Department of Planning & Zoning, 80 Front Street, and in the Office of the County Administrator, 84 Courthouse Square, Lovingston, VA, 22949, M-F, 9 am to 5 pm. For more information call Planning & Zoning (434) 263-7090, or toll free at 888-662-9400, selections 4 and 1. The items contained in this legal notice will also be available for download on the County Calendar under the meeting event at http://www.nelsoncounty-va.gov/events/category/county-calendar/. The County of Nelson, will hold a public hearing on Tuesday, December 8, 2015 at 7:00 PM or as soon as practical thereafter in the General District Courtroom of the Courthouse in Lovingston, Virginia to solicit public input on the proposed Community Development Block Grant (CDBG) proposal to be submitted to the Virginia Department of Housing and Community Development for Nelson County-Wild Wolf Infrastructure Project. Residents of the project area are encouraged to attend. The Nelson County-Wild Wolf Infrastructure Project proposal will include the following activities: installation of approximately 2200 feet of HDPE sewer force main from the Aqua Virginia pump station on State Route 151 to 2461 Rockfish Valley Hwy (Wild Wolf Brewing Company) ending with a coated manhole. Wild Wolf will then provide the connections and pump station from their property to the coated manhole. The draft CDBG proposal will be presented for comment along with information on projected beneficiaries, including the number of to low-and-moderate income residents to benefit from the proposed project, and plans to minimize displacement. Citizens will also be given the opportunity to comment on the County of Nelson’s past use of CDBG funds. A fact sheet on the proposed project and the draft proposal is available at the County Administrator’s Office, 84 Courthouse Square, Lovingston. For additional information, contact the County Administrator’s Office at (434) 263-7000. Comments and grievances can be submitted in writing to the Nelson County Administrator’s Office at P.O. Box 336, Lovingston VA 22949 or by phone at (434) 263-7000, (434) 263-6255(TDD), or by fax at (434) 263-7004 until 4:00 PM, Monday, December 7, 2015. If you plan to attend and have any special needs requirements, please call the number listed above. EOE. The County of Nelson, will hold a public hearing on Monday, November 30th at 6:00 PM in the Former Board of Supervisors Room (#420) of the Courthouse in Lovingston, Virginia, 84 Courthouse Square. The purpose of the public hearing is to solicit public input on local community development and housing needs in relation to Community Development Block Grant (CDBG) funding for a project in our community. Information on the amount of funding available, the requirements on benefit to low-and-moderate income persons, eligible activities, and plans to minimize displacement and provide displacement assistance as necessary will be available. Citizens will also be given the opportunity to comment on Nelson County’s past use of CDBG funds. All interested citizens are urged to attend. For additional information, contact the County Administrator’s Office at (434) 263-7000. Comments and grievances can be submitted in writing to the Nelson County Administrator’s Office at P.O. Box 336, Lovingston VA 22949 or by phone at (434) 263-7000, (434) 263-6255 (TDD), or by fax at (434) 263-7004 until 4:00 PM, Friday, November 27th, 2015.